If you do not properly understand probability, you are more likely to make incorrect assumptions and decisions in your Trading and Investments. A cognitive bias is a mistake in reasoning, evaluating, remembering, or other cognitive process, often occurring as a result of holding onto one’s preferences and beliefs regardless of contrary information. Cognitive biases or fallacies can influence one’s decision making which can lead to unwanted consequences. Financial Market players are highly prone to cognitive biases more than other professionals because money is something everyone is emotionally attached to. Being said that, here’s the list of 5 Major fallacies and biases that can hurt traders and Investors alike. The gambler’s fallacy, also known as the Monte Carlo fallacy or the fallacy of the maturity of chances, is the mistaken belief that, if something happens more often than normal during a given period, it will happen less frequently in the future (or vice versa). Flip a coin. What’s the probability of heads? 50-50. Suppose you flip the coin five times. Each time it is tails. For the sixth flip, what’s the probability of heads? Still 50 – 50. The prior coin flips have no impact on the next one. Each coin flip is independent of the others. Those who fall prey to the gambler’s fallacy would bet on heads. Now apply the same concept to Trading or taking Investment decisions – substitute Heads and Tails with winning and losing trades. You take 5 trades which have ended up with profit and now you have an unconscious feeling that your sixth trade will also likely end up in profit. Yep! That’s gambler’s fallacy in action. It’s an innate belief that our past and future trades are connected with each other, which is technically wrong. The best way to avoid gambler’s fallacy is to understand that no matter how many winning trades or losing trades we face, the outcome of next trade is independent of earlier trades. We don’t like to lose things that we own. We tend to become extremely attracted to objects in our possession, and feel anxious to give them up. Of course, when that object turns out to be money our emotional attachment is twice than normal! In Lose aversion, Losses hurt about twice as much as gains that makes you feel good. Many Traders and Investors tend to dislike losing more than they enjoy winning. Instead of calculating risk in proportionate to Reward, they only look at the size of risk. In trading or Investing, Risk – Reward are the two sides of same coin. Instead of understanding this, they end overestimating the risk and avoid taking any reasonable actions. Market players with loss aversion bias feel more discomfort from potential losses in comparison with identical gains. Mostly two and half times strong discomfort from losses. It can lead to inaction rather than action. The best way to overcome loss aversion bias is to change the Mindset. Accept that losses are inevitable part of the game; it’s the cost of being in Trading business. Do not get discouraged by the size of stop-loss, instead compare both stop-loss and reward potential of a trade. Prepare a trading plan before you get into a trade and give trades some space to move and don’t set your stop losses too tight. Bandwagon bias is a form of group thinking. It’s a cognitive bias that makes us believe something is true or false because other people believe in it. Individuals will do something primarily because other people are doing it, regardless of their own beliefs, which they will ignore or override. In Investing and Trading, Bandwagon effect takes multiple forms! Say for example, if a Friend from a particular group buys a specific stock and gets some monetary gains, sooner or later everyone from that group buys the same stock without any proper reason. Traders looking for tips and recommendations are an example of Bandwagon bias. Always keep in mind; something is not true simply because everyone seems to say so. Never read or listen to market commentaries or news when you trade. Only use them in your research process. Think for yourself and trade by yourself. Over analysis fallacy is also known as “Analysis Paralysis”. It is the state of over-analyzing (or over-thinking) a situation so that a decision or action is never taken, in effect the outcome is never reached. In simple words, it’s overthinking leading to inaction. The quote “too much is too bad” applies perfectly for this fallacy! When you take too much information to analyse, it can cause congestion in your thinking. Very often you see a good trading opportunity, however when you continue to analyse more and more, you begin to feel less sure about it. That’s the over analysis fallacy. 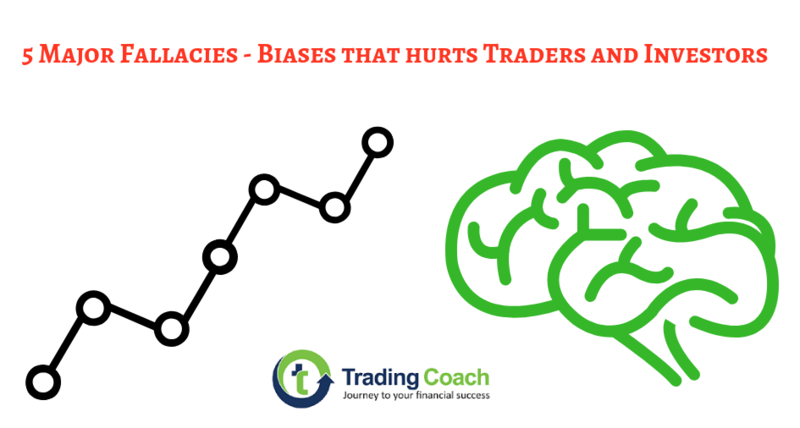 Many Traders often over-analyse themselves before taking a trade or after losing a trade, some traders fill their charts with 5 – 10 indicators, all this type of behavior can lead to analysis paralysis. Too many external influences like news, other people’s opinion, unwanted indicators etc. can cause confusion and over-analysis. Another important factor is looking for perfect results or perfect trades. These are probably the biggest reason traders overthink themselves, best solution is ignoring these external influences and sticking to a proper trading strategy. Confirmation bias is a psychological phenomenon in which a person tends to accept those references or findings which confirm his/her existing belief in things. Confirmation bias leads people to stick with information that validates their own point of view and dismissing any input that conflicts with it. In trading or investing, Confirmation bias suggests that an investor is more likely to look for information that is in support of his or her trading idea than which contradicts it. For e.g. once you find a trading signal or a setup on your chart, you’re more likely to look at Indicators which will confirm your idea rather than against it. Because we take in contradicting information differently, we’re often subject to faulty decision-making as a result of one-sided information which skews our frame of reference. Investors and traders tend to have an incomplete picture of a situation because of confirmation bias. When everything is confirming your market view or supporting your trading idea, think again and look for reasons against your view. This can help us from falling into the pit of over confidence and confirmation bias in Trading. Understand these cognitive biases and fallacies, recognize them beforehand. It will help you to improve your trading performance and make it more solid proof! We cover simple and effective trading psychology routines in our premium training program that could help traders to avoid and overcome such biases and fallacies.